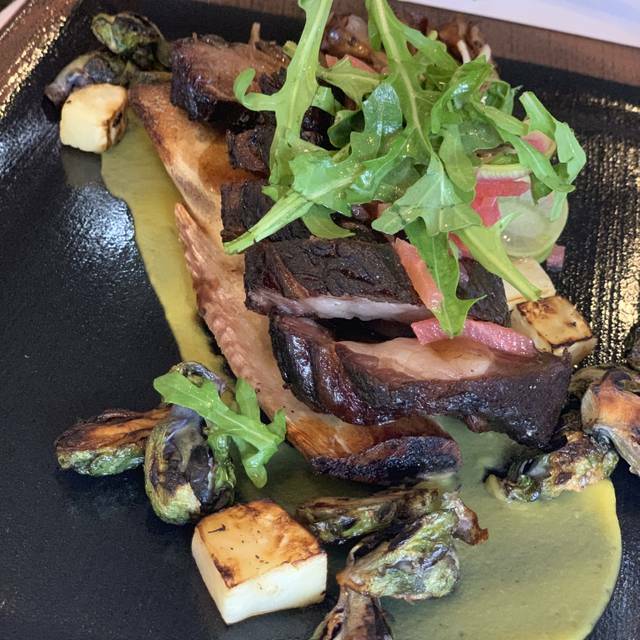 The AAA Four Diamond restaurant at the Goldener Hirsch Inn features American contemporary cuisine ,with a European flair from Executive Chef Ryan Burnham. With its charming Austrian décor, The Goldener Hirsch Inn Restaurant is an exceptional choice for a romantic dinner in front of the fireplace or a group celebration. ~ “Four Diamond Rated” by AAA for "exceptional cuisine, service and an elegant dining experience"
Our main dining room can accommodate up to 100 guests for a private party. For smaller groups, we have a more intimate private dining room that seats up to 30 guests. Full off-site catering is available for any party need; from a drop-and-set meal for 6 to a full catered event. Our restaurant is available for private parties, corporate reteats, rehearsal dinners and weddings. Please inquire within. Authentic Bavarian atmosphere, and the best wienerschnitzel outside of Bavaria! We always enjoy dining at the goldener Hirsch, but I can remember when we had an un obstructed view of the skiers on the slope 25 years ago. Sad it has become so built up. Our food was over cooked, and besides that nothing special. Atmosphere was nice. Excellent dinner my family and I had this recent visit. The food tasted great and was presented well. Nice cozy restaurant. Service was superb. We will return. Excellent food and ambiance but very disappointing service. I had specified that we were there for my birthday but got no acknowledgement. Other tables around us were also celebrating birthdays and we could see that the restaurant acknowledged them. Maybe our waiter was new and needed training but he was useless. He could not answer even basic questions about the menu and was generally inattentive. Unexpected and unacceptable in a restaurant of this level and at these prices. Very good authentic food. The prices are higher than they should be but a great treat otherwise. Brought our own wine and enjoyed our evening. A restaurant worth considering for a special night out. John was an amazing waiter. The food was outstanding. Loved every minute of our time there. Dylan and James ROCK the GH. Asked for either of them and if Dylan is tending bar, you are in for a treat and a great buzz. The service was poor. Our waiter was unfriendly, socially awkward and had no warmth. Superior food from an interesting menu. Excellent, friendly, knowledgeable service; waiter had a point of view and thoughtful recommendations. Fully priced at New York levels. Worth the trip; we will return. We were disappointed with the inconsistencies. Server was very attentive but schnitzel (which I would expect to be a signature dish was dry and sauce was meh). Salads were good. Overall it would not have been that bad,but we were seated in an area that smelled like cheese and made it difficult to enjoy eating. For the prices I’d just expect a lot better. Great old world charm and delicious food. Don’t miss if you are in Deer Valley and want a charming relaxed dinner after a hard day on the slopes. Never been there outside of winter, but love it every time! Wonderful food. The weiner schnitzel is a must!!! Excellent food, service and overall experience. I felt like we were In Switzerland or Austria. We cannot say enough good things about our dinner experience. From the impeccable service of our waiter (Kade) to the blend of flavors created by the chef, the night was top notch. We will surely visit again on our next trip. One tip, although we very much enjoyed the signature fondue, the dish is filling and we ended up splitting an entree. Not a bad thing, and Kade had warned us in advance, next visit we will be sampling more of the menu, we are positive it is all great! This is one of our favorite places in Park City. The food is always outstanding and the service is fantastic. The waiters are always familiar with the menu and able to give great recommendations. We usually have the fondue (always good) to start off our meal. This trip we had the salmon appetizer and it was delicious! The restaurant and staff were excellent. we enjoyed everything about this dining experience from the moment we got there. Great hostess, waiter and menu. Food was fantastic. wine pairings by waiter made dinner special. Great menu and food quality. would love to have gone for Fondue lunch....First reservation on return to Deer Valley. The meal is always delicious but the price tag has jumped exponentially. A dinner for 4 (2 kids) without a bottle of wine or cheese fondue was over $500. Entrees range from $40+ to over $50. Our favorite restaurant in PC. Service was wonderful, food was amazing. We started with the charcuterie board, the cheeses were unusual and delicious. For the main I had the Elk and hubby had the schnitzel, both were terrific. Cheese and chocolate fondue were delicious and a fun experience with friends. Entree choices were varied and all delicious- fish, duck, chicken. We would come again. Our family love sharing the fondue and now they added wavy beef as an add on!!! An absolutely lovely restaurant with delicious food and charming staff. Our favorite restaurant in Deer Valley. Always a great meal with wonderful service and atmosphere. John was a tremendous waiter and very helpful and personable. We will definitely keep coming back. Cheese fondue for table appetizer was perfect Very Austrian! Very "ski" vibe! Schnitzel was excellent and the elk tenderloin also received thumbs up! Lovely setting and good food, presented well. Portions are not too large. Starters are meant to be shared which adds to the friendly feel. Service is a bit uneven. Service was very weak here. We had difficulty getting any server's, let alone our own server's attention numerous times. We weren't asking for much, just a few forgotten/delayed drinks we had ordered when we first arrived, and getting someone to re-ignite the sterno for our fondue. Each person seemed to think it was someone else's job. Very strange. Cute place though and the food was good! Everything was perfect. The cobia/lobster dish was unique and delicious. Excellent food and ambiance. Only issue we had was I requested my soup be served before my entree. Instead they brought the two out simultaneously. I pointed this out to the server who I am sorry we will take your Wienerschnietzel back to the kitchen and keep it warm. The problem with was that when it returned it was rather dry. The food was well prepared and the wine list was good. The restaurant was busy and we felt rushed. The atmosphere was quaint. The duck was excellent--the waiter recommended medium rare but I requested medium--unfortunately it was medium well--but very tasty. My daughter had the rack of lamb that was INCREDIBLEY delicious and tender. My husband had the elk and it too was excellent. Skip the Bavarian pull down bread it was only so so--not the fabulous bread that you actually get in Bavaria. For dessert we shared the mousse cake--it was OK--the waiter said it was mostly mousse but when it came out it was half devils food cake and half mousse-- and for me there was too much devils food cake. Just an amazing dining experience in every aspect. Our main server Kade was exceptional. Oh so good! The food, the service, the ambiance! Will definitely be back! Goldener Hirsch is an absolute favorite and a top choice for either a nice lunch or well deserved after ski dinner. The food and service are every bit as good as the atmosphere which is delightful. Menu is appropriate for the mountains with many appealing options and the wine list carefully chosen to complement the food. You won’t regret coming. Excellent attentive service from every staff member who interacted with us. Delicious, interesting food. Would love to return on a future visit to Deer Valley. Would love to stay in the hotel too! Excellent food and service in a charming setting. Always head to the Goldener Hirsch when we are skiing in Deer Valley. Great for lunch fondues, afternoon football games in the bar or lovely dinners. Knowledgeable staff re: wine, and good wine selections to go with your Austrian meal. This time we were seated in the bar, by our request, so that my husband could watch football and sat by the crackling fire so that we could warm up. We ordered our favorite cheese fondue and then were lucky enough to have Kade as our server that evening. His enthusiasm for his profession, his wine suggestions, attentiveness and professionalism made our evening superb!! Always feels like we have come home when we spend an evening at Goldener Hirsch. Kade was special, but his supervisor Ruth also kept things running smoothly within the bar/reception area all evening. Thank you all! !